Interview: Etaf Rum, Author Of 'A Woman Is No Man' Etaf Rum's new novel draws from her own experiences of arranged marriage and early motherhood in the close-knit Palestinian American community where she grew up — and which she eventually left. 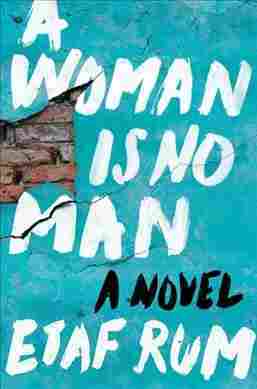 Etaf Rum's new novel, A Woman is No Man, may violate a code of silence in the tight-knit and often closed Palestinian American community of Brooklyn in which she grew up, and which she left. Her protagonist, Isra, was born in Palestine, but comes to Brooklyn when her family arranges a marriage to Adam, who runs a deli across the river in Manhattan. The narrative eventually shifts to Deya, the oldest of their four daughters, who is left to tell her mother's story — a story that comes to embody stories of generations of women in that community, and a story that has its roots in Rum's own arranged marriage. "There weren't many choices for me as a kid growing up, and so marriage and motherhood, that was the path that was prescribed for me," she says. Oh, absolutely — that was one of the main struggles that I had while writing A Woman is No Man. One of those struggles was confirming stereotypes about Arab people and the Arab community, stereotypes that include oppression, domestic abuse, terrorism. And so that kind of hindered my ability to express myself freely, without fear, in the beginning when I was writing the novel. And it took me a long time to overcome those fears and realize that in order for me to speak on behalf of women who are abused and oppressed, and to tell their stories — especially those women who are afraid to tell their own stories, because they're ashamed, and because they feel like someone will come and retaliate, that I had to overcome that fear and tell this very authentic story. It took me a long time of doing what I was supposed to do. I was supposed to get married, I was supposed to have kids, and when I moved to North Carolina when I was 19, and I had my daughter right away, I had my son two years later, at the same time, I was struggling with this idea that the only thing that I can do was be a mother and be a wife. So I went to college, I maintained my education despite the pressures around me to stay home and take care of my kids, and slowly, as I educated myself — I wasn't just educating myself intellectually, but emotionally as well, until I began to realize my place in the community and the cycle of trauma and oppression that I will be giving my daughter if I don't speak up to what I want to accomplish with my life, if I don't stand up for myself. I'm divorced, I don't have a sense of family, and I feel like because I stopped doing what I was supposed to do, I've let the people closest to me down, in order to achieve what I think I should be doing. Absolutely — and that's where the title of my book stems from. My grandmother would tell this to me often — I would say, "Well how come I can't do so-and-so? Why can't I do what a man can do?" And she'd say, "Because. You can't do this because you're not a man." And the further I began thinking and writing about this, and the more I realized that women are also no equal to men in that they are responsible for so many things — maintaining family relationships, making sure that they are enlightening their children and instilling them with values — and so, they are actually more resilient and stronger than men. And so I wanted to take that title and make sure that it's seen in both ways: In the oppressive, limiting way that we use, but also in the ways to make sure that women understand their resiliency and their strength. This story was edited for radio by Samantha Balaban and Peter Breslow, and adapted for the Web by Petra Mayer.